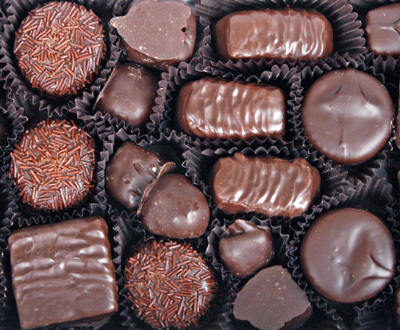 Chocolate candy is a popular Valentine’s Day gift. Chocolate was originally enjoyed as a bitter beverage. Mesoamerican peoples long before Europeans came to the Americas, but in a very different form than we enjoy it today. Originally a bitter beverage (often mixed with maize, chile pepper, vanilla or honey), it wasn’t until the 1840’s that sweetened chocolate bars were developed. Cacao beans were brought back to Spain by Columbus, and the beverage was introduced a few decades later to the Spanish court by Mayan nobles brought from the New World to Spain by Dominican friars, and within a century had spread throughout western Europe. Once Europeans acquired a taste for chocolate, the cacao tree was moved throughout tropical areas where it could be cultivated in order to meet the demand for this beverage, and later, the solid confections. The seeds, or cacao beans, were also used as a currency in pre-Columbian Mesoamerican civilizations. 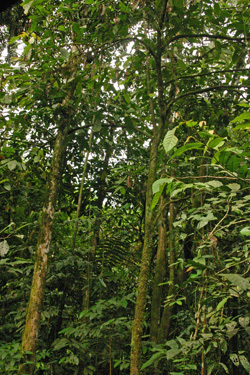 Tree and pods of Theobroma simiarum, cacao de mico or monkey cacao. There are actually 22 species of Theobroma in the plant family Sterculiaceae (although this family is considered by some taxonomists to be part of the Malvaceae), but only three are suitable for human consumption. Only one, T. cacao, is commonly used for commercial production. It is a are small understory tree which evolved in the shade of the heavy canopy of the rainforests in the Amazon basin on the eastern equatorial slopes of the Andes and was distributed by early humans throughout Central America and Mesoamerica. Nondescript Theobroma cacao trees growing in the rainforest. In the wild this tree is typically found along rivers, where it grows 15-25 feet tall and lives for up to 100 years. Cultivated trees, however, are kept shorter to make harvesting easier and are economically productive for only about 60 years. Wild trees will have a taproot up to 6 feet long, but those grown vegetatively (from cuttings) do not have a taproot. Most plantation-grown trees are cultivated underneath banana or other large-leafed trees as a substitute for the natural rainforest canopy. It is only grown in selected areas of the tropics – almost exclusively within 20 degrees of the equator in areas that are not too mountainous, although most of the large commercial plantations are in a narrower band closer to the equator – as it needs a consistently warm, wet climate year round and does not tolerate drought. Most of the world’s supply of commercial cacao now comes from Africa. The only US-grown cacao is produced on a number of small farms in Hawaii. The flavor of chocolate depends on many factors including when pods are harvested. 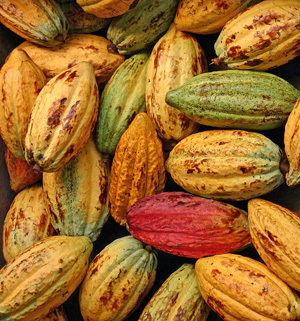 Various factors, including the type of soil, amount of rain, cultivar, and when the pods are harvested contribute to the widely varying and unique flavor of cocoa beans. There are three traditional classifications of cacao types based on their origin and complexity of flavor, with some having spicy or fruity notes, others more intense chocolate flavor. Recently researchers have identified ten different genetic variants of cocoa based on genetic traits. These types vary in disease resistance and hardiness; some are favored by growers for their ease of growth (“bulk beans”) rather than flavor profiles (“flavor beans”). Chocolate makers typically blend these to create a more sophisticated finished product than the more common bulk beans alone would make, or use the flavor beans by themselves to create super-premium chocolate. 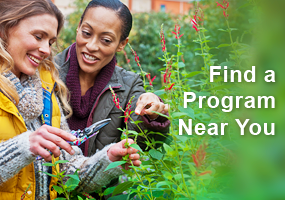 This evergreen tree produces alternate, smooth-edged, dark green, oblong leaves about 5-15 inches long. It produces and then loses its leaves in 2 to 4 flushes a year. The new leaves are reddish and hang downward to lessen their exposure to the strong tropical sun until they have hardened off. The leaves are actually able to move up and down from vertical to horizontal to increase or minimize exposure to the sun as a node at the base of the leaf changes stiffness with temperature. 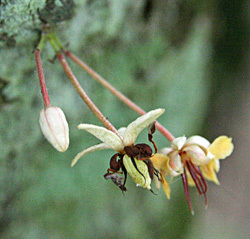 Flowers of Theobroma cacao are produced on the trunk. Cacao is cauliflorous, meaning the flowers are produced directly on the trunk or older branches of the tree. Temperatures fluctuate very little in its habitat, so tees are in a continual state or reproduction. Clusters of small, unscented white flowers are produced year-round, so that both fruit and flowers may be on the tree at the same time. The flowers are self-incompatible, so cannot fertilize themselves, and any flowers that are not pollinated within a day of opening will die and fall off the tree. They are pollinated primarily by Forcipomyia midges that live in rainforest areas with humid shade and decaying matter on the ground. Large commercial plantations typically are lacking in these conditions, so pollination is often poor under these conditions. Cacao trees grown in smaller plantations under more “wild” conditions tend to have better pollination success. But even under the best of conditions, pollination is infrequent. It is estimated that only about 1% of the flowers are fertilized and bear fruit. Because of this, the cacao tree produced massive quantities of flowers. The fruit – botanically a berry – is a football-shaped pod that takes 5-8 months to mature. Many pods die while they are still small and immature. The successful pods start out green, but eventually change to a yellowish, orange, red, or purple color. 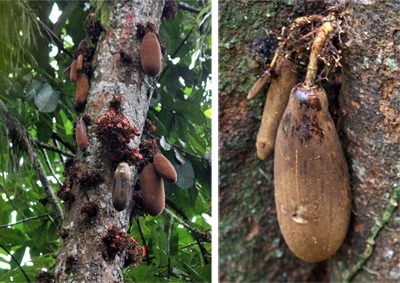 The fruit or pod of Theobroma cacao. 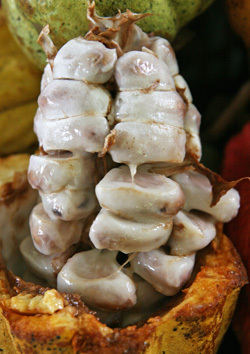 An opened cacao pod, with stacks of seeds covered with sweet white pulp. The pods grow to 5-12 inches in length and weigh about a pound when ripe. The spherical to oblong pods have 5-10 longitudinal ridges and can be smooth, wrinkly, or warty. Each pod contains 20-40 oval seeds – commonly called cocoa beans, even though they are not beans – encased in a slippery, yellow to white pulp. The edible pulp is sweet with a flavor reminiscent of lemon or mango. The pods do not drop off the tree or break open when ripe. 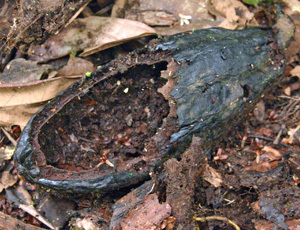 A dropped, decaying cacao pod with the seeds gone. In their natural habitat the seeds are dispersed by monkeys, fruit-eating bats, rodents, and other small mammals which open the pods to eat the tasty pulp. Once the pods are open, other animals such as reptiles, insects, and birds also help in scattering the unpalatable seeds on the rainforest floor. If the pods are not opened by animals, the seeds may germinate as the pod begins to rot, and the seedlings grow until the pod breaks open and they drop to the ground. Trees begin bearing fruit at 3-4 years old, but don’t really come into full production until reaching about 10 years. They can bear 300 to 1,000 pounds of cocoa per acre for about 50 years. It takes 20 to 25 pods to get 2 pounds of cocoa. 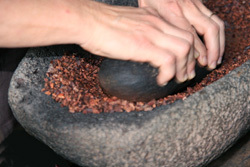 In order to produce chocolate, the cacao seeds must be processed in several steps, beginning with fermentation. After the pods are carefully removed from the tree, the soft, wooden-like shells are split open and the seeds removed. The seeds, with the pulp still covering them, are put into covered containers (or are rolled up in banana leaves), allowing naturally occurring fungi and bacteria to develop and begin the fermentation process. The fermentation process kills the seeds’ embryo and beaks down toxins in the seeds, reducing their bitterness and beginning the development of the characteristic chocolate flavor and color. After three days the beans are dried, cleaned, graded, packed, and shipped for processing into chocolate products. 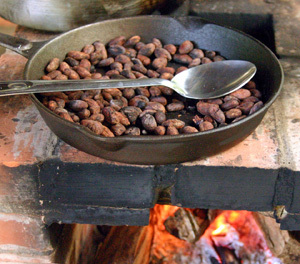 Traditionally, cacao beans were roasted in iron skillets over an open fire. Next the seeds are roasted and the outer skins rubbed off. You can purchase those discarded husks as cocoa mulch! Traditionally this was done on wide iron pans over open fires, but now electric, computer-controlled roasting machines are used. Roasted cocoa beans (L) and one seed with the hull partially removed (R). The remaining kernels, called nibs, are ground into a thick, dark-brown paste called chocolate liquor. This may be further processed into cocoa powder by extracting the cocoa butter and pulverizing the solid remains. Grinding cocoa nibs on a stone metate. This was accomplished on stone metates by pre-Columbian peoples, but now large heated rollers are used in high-speed mills. These products are later mixed with various ingredients, including sugar and milk solids, to produce the confection we enjoy as chocolate. This evergreen tree can be grown in a large container as an indoor plant – more as a curiosity than to produce cacao beans – but it can be rather challenging to provide the right conditions. 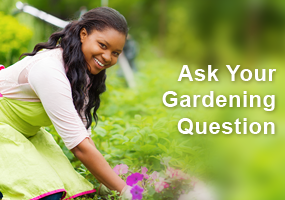 It requires a minimum temperature of 60°, but does better at warmer temperatures and high humidity. Excessively dry air will cause the thin leaves to dry out on the edges and cool temperatures or drafts will kill the leaves. 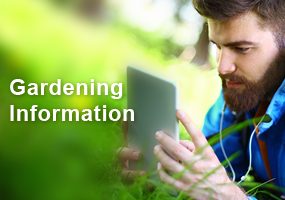 It needs bright light, but can burn quickly if moved outdoors without acclimation to the new conditions.